PST Splitter tool allow you to split large or unmanageable PST file into smaller or manageable ones. Split PST software has no compatibility issue with PST file formats whether it is ANSI or UNICODE, The software will cut PST of any of two formats into smaller chunks. Outlook PST splitter enable user to divide PST file into 3 unique splitting option i.e. Split PST software has the capability to handle corrupt PST file, it can split oversized 2GB file size corrupted PST file into smaller PST file according to different option as suggested above. PST Splitter software splits up entire data of mailbox including each folder and subfolders of Email, Contacts, Tasks, Calendars and their associated information too. After splitting PST file, the split PST software will generate a complete comparison log report in CSV format from where you can compare the sum and difference of items before and after PST file splitting. Split huge PST file into manageable ones will retain all Metadata (Cc, Bcc, To, From etc. ), Appointments and Attachments reserved as in original PST file. As well as splitting doesn't affect the folder structure hierarchy of generated PST files. PST (Personal Storage Table) file is created in MS Outlook when configured with a POP3 or IMAP based user account. These files are stored on the local machine of the user, which can be accessed using Outlook. PST file consists of user’s data like emails, contacts, calendar etc that too in different folders. The main reason for creating PST file is that these can be used to restore deleted items from the server. Where to look for PST file? You cannot directly access PST file on the system. To Locate the PST file you first need to open Outlook Application>> then right click on respective email account>> finally click on Open File Location. There are number of reasons responsible that requires to split PST file. The foremost reason is when PST file crosses the specified size limit i.e 50 GB currently. In case of Oversized PST file in Outlook, many problems are experienced like Unable to open PST file, Outlook hangs when sending and receiving emails etc. This problem can be solved by using Intrigua Split PST tool which will break PST file by size, date, year. Step 1: Launch the Software and add the PST file. Step 2: Specify the Splitting option. Step 3: Select the targeted folder and begin splitting process. 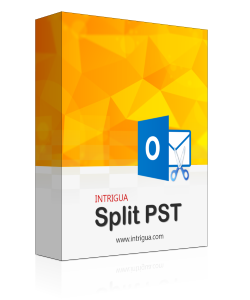 Know more about the working of outlook Split PST software by clicking on this interactive video. This video is created for the ease of our users so that they can easily divide large PST. Does Split PST Software supports Windows 10 technical preview? Yes. Split PST software has no compatibility issue with any version of windows. Do I need to have MS Outlook installed on my system to perform Split PST process? Yes. MS Outlook must be installed on your system to divide large PST into smaller ones. Can I split corrupt PST File using this tool? Yes. 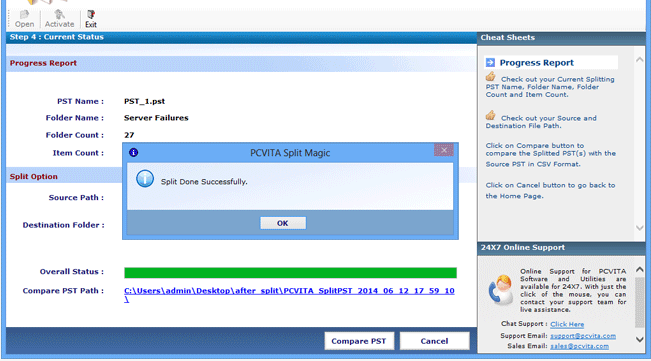 You can split PST file easily using this software even if the PST is corrupted. Does this Software split multiple PST file? No. 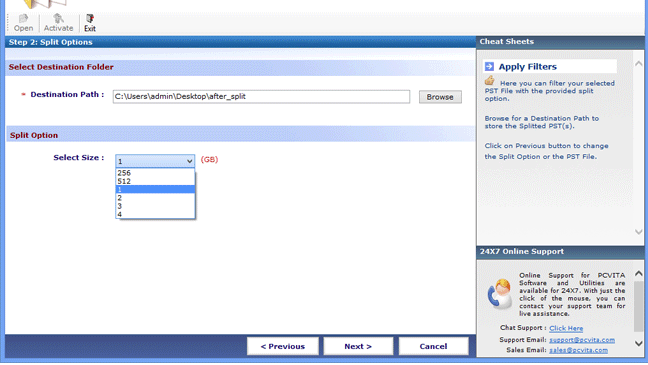 Split PST tool cannot divide multiple PST file at one go, you have to split them one by one. How can I verify the targeted PST file with source PST file? At the end of split PST process software will generate whole process report in CSV file format, from this report you can verify the data items of targeted PST file with source PST. How much time does the software take to split PST file? It doesn't take much time to perform split operation but it depends upon the size of PST file and system configuration. 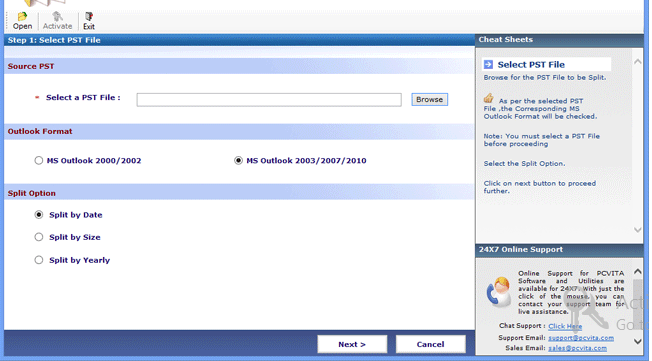 The Tool Supports MS Outlook version 2013, 2010, 2007, 2003 & 2000 (32/64 bit- Any Version of MS Outlook). Microsoft windows are supported by Split PST software including Windows 8.1,8, 7, Vista, XP, 2008, 2005, ME, & NT (Any Version of Microsoft Windows). 20 MB of free hard disk space should be available to run Split PST software. I have some important data stored in my old PST file that is in ANSI format. With the help of the INTRIGUA Split PST tool, I was able to divide old PST file into smaller files with UNICODE format, which is not bounded by 2GB file size limitation.